How does the Bank On Yourself concept stack up against the investment strategies being hyped by Wall Street and financial “gurus” like Dave Ramsey and Suze Orman? Glad you asked. It’s like comparing apples to oranges. 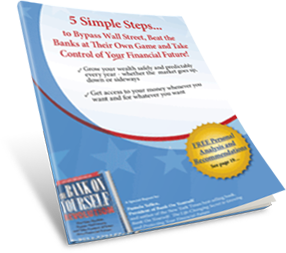 The Bank On Yourself method is a step-by-step process that builds your wealth without the nail-biting ups and downs of traditional investments. Having doubts? Clinging to the same old “conventional wisdom” financial strategies, even though you aren’t seeing the results you were told you could expect? Sigh. We’re used to hearing naysayers. We certainly won’t hold that against you. But let’s clear this up right now: Here’s a smack-you-between-the-eyes, side-by-side analysis comparing Bank On Yourself with the most common traditional investment strategies. So go ahead and compare your financial plan to Bank On Yourself. We dare you.